Alexa, Amazon’s cloud-based voice service, powers voice experiences on millions of devices, including Amazon Echo and Echo Dot, Amazon Tap, Amazon Fire TV devices, and devices like Triby that use the Alexa Voice Service. One year ago, Amazon opened up Alexa to developers, enabling you to build Alexa skills with the Alexa Skills Kit and integrate Alexa into your own products with the Alexa Voice Service. 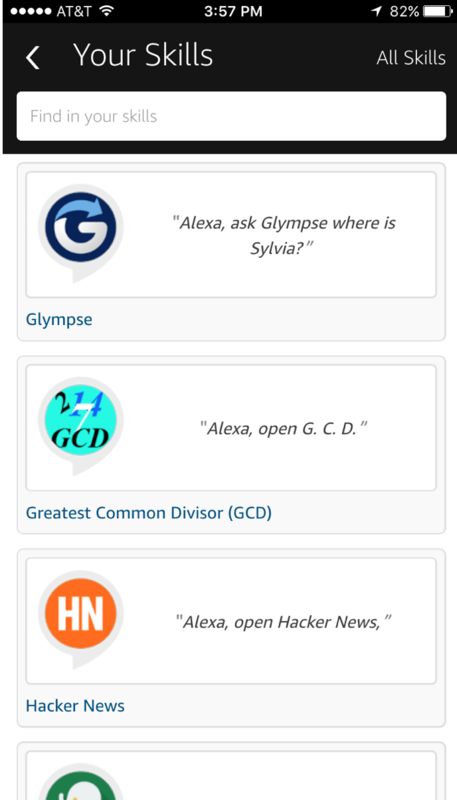 Today, tens of thousands of developers are building skills for Alexa, and there are over 1,400 skills for Alexa – including Lyft and Honeywell, which were added today. Today, we announced new ways for customers to discover and use your Alexa skills, including a new voice-enablement feature and a completely redesigned Alexa app. Customers can now quickly search, discover and use your skills. 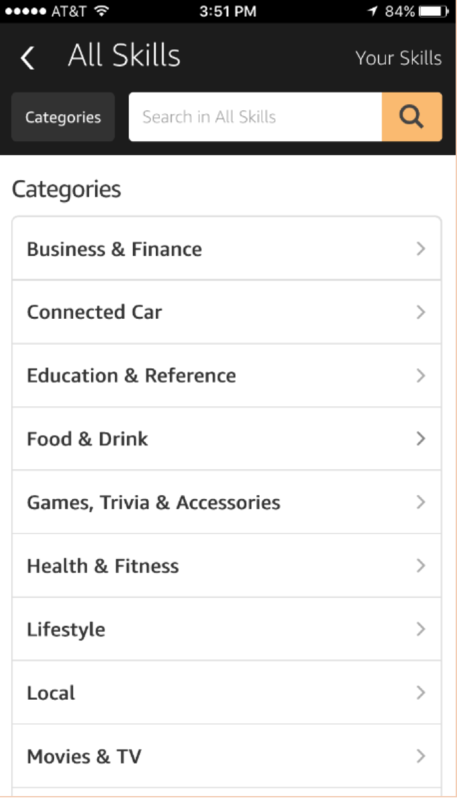 Starting today, customers can browse Alexa skills by categories such as “Smart Home” and “Lifestyle” in the Alexa app, apply additional search filters, and access their previously enabled skills via the “Your Skills” section. Announcing Three New Stops for the Alexa Roadshow: Seattle, London and Berlin! A free event that will provide an introduction to using Amazon Web Services with the Alexa Skills Kit to build voice driven experiences on Amazon Echo and other devices. The day will also include an open hackathon providing you time to get your hands on building a new Alexa Skill. We are happy to announce two frequently requested Alexa Skills Kit features are now live! Starting today you can take advantage of Account Linking allowing customers to easily link their accounts with yours and a new Service Simulator for testing your skill. With the Alexa Skills Kit, you can now easily allow your customers to link their existing accounts with you, to Alexa. To link accounts, customers visit the skills tab in the Amazon Alexa app and enable your skill. They are then prompted to log in to your site using their normal credentials. You authenticate the customer and generate an access token that uniquely identifies the customer and link the accounts. To connect an Alexa user with an account in your system, you need to provide an access token that uniquely identifies the user within your system. The Alexa Skills Kit uses an OAuth 2.0 implicit grant authorization to obtain this access token. The resource server and authorization server are both part of your system and the client seeking access is the Alexa service. Once an Alexa user grants the Alexa service access to the resource server, the Alexa service stores the access token. This token is then included in requests sent to your skill. I recently sat down with fellow evangelist Jeff Barr and we chatted about all things Alexa. We covered the Amazon Echo, the new Alexa Skills Kit and creating new skills with the AWS Lambda compute service. If you’ve been looking to get started with Alexa this podcast episode only runs about 23 minutes and is a great place to begin. While working with the Alexa platform over the last few months, it occurred to me that some of my favorite text games could be made more accessible to today’s game players through voice control. There has been a resurgence of text based, narrative gaming; and access by voice takes the experience to a whole new level of interaction. Successful video games have solid characters and background stories that are driven by conflict. Text based games rely even more heavily on their story. And the voice interaction enabled by Alexa provides for an extremely intimate dialogue between the gamer and the game. Watch the Alexa adventure game on YouTube here. Dialogue is the User Experience for voice based games and so it is where you will spend most of your time when designing the game interactions. While the speech-to-text capabilities of the Alexa platform are impressive, it is important to simplify the customer controls so the game can not mistake the gamer’s instructions. 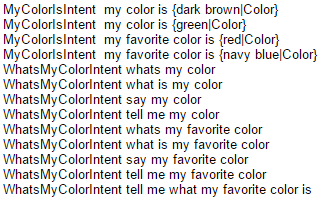 As part of developing an Alexa skill, you define the syntax and provide sample utterances. Syntax defines the available customer intents and the sample utterances help the Alexa platform map speech to those intents. Alexa: “You are standing on a dusty road with a large, vibrant lake to one side and a dark forest to the other. 1. Walk north along the road? 2. Walk south along the road? 3. Dive into the lake? Clearly the game needs to understand where the gamer’s directional command will take them and handle an invalid choice appropriately or in some entertaining manner. In this case, I really don’t want the lake to be an option, so if you go into it you are sure to drown. For the other options, the game will take the gamer to the next scene and change the state of the game. The important thing to your game is that the correct intent is identified and that each slot has a value that it can recognize and respond to. The more sample utterances you provide, the better the recognition quality becomes through the Alexa platform. Until the quality reaches a certain level, game play can become quite frustrating for the gamer. Make sure to test the utterances you are most likely to expect from the gamer and do what you can to accept words that are close enough. If the gamer says, “Hit the ogre with rocks,” it is possible that Alexa hears “Hit the ogre with rock.” The very subtle difference between “rocks” and “rock” should be handled by your game. You may need to employ more advanced forms of recognition heuristics within your game in order to account for these variances in the speech to text mapping from Alexa. The Alexa platform is also continually improving its audio recognition heuristics and improves over time as more complex speech is presented to it. In just a few weeks of using some of my basic games, I have found that recognition has improved significantly. 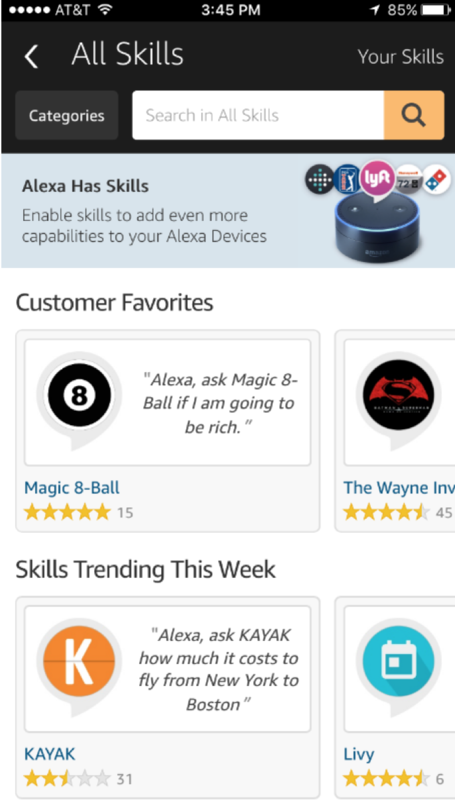 With the launch of the Alexa Skills Kit you have a unique opportunity to create new Alexa gaming skills customers can teach their Alexa enabled devices, like the Amazon Echo. By submitting your Alexa skill today you will be ready when we launch the first new capabilities built using ASK later this year. We can’t wait to see what you create! To get more details on how to get started, check out this Introduction to Amazon Echo and the Alexa Skills Kit by Dave Isbitski. Want the latest app and game news delivered to your inbox? Stay in the loop on the latest industry best practices, Amazon promotions, and new launches by subscribing to our weekly blog summary here. We recently launched the Alexa Skills Kit (ASK), a collection of self-service APIs and tools that make it fast and easy for you to create new voice-driven capabilities for Alexa. Alexa is the same cloud-based voice service that powers Amazon Echo, a new category of device designed around your voice. With a few lines of code, you can easily integrate existing web services with Alexa or, in just a few hours, you can build entirely new experiences designed around voice. No experience with speech recognition or natural language understanding is required—Amazon does all the work to hear, understand, and process the customer’s spoken request so you don’t have to. You should also check out this free 38 minute video that will introduce you to the capabilities of the Alexa Skills Kit (ASK) using an Amazon Echo device and walk you through building your own skills for Alexa. We use AWS Lambda as an example hosted cloud service – you can follow along at no cost using the AWS free tier. After watching the video you will have an understanding of the Alexa Skills Kit and be able to publish an Alexa skill that can be enabled on an Amazon Echo device. You can watch the video here and download the slides here. “Alexa” is the wake word for the Amazon Echo. This starts the user’s conversation with Alexa. “Ask…to” is one of the supported phrases for requesting a particular ability. There are several phrases that end users can say, such as “ask..to,” “ask…for,” “tell…to,” and many other variations listed in Supported Phrases to Begin a Conversation. “Greeter” is the invocation name that identifies the capability the user wants. The name should be chosen to fit well into “ask”, “tell” or the other supported phrases, and does not need to stand alone as a phrase. Alexa uses this to determine where to send the user’s request. · “Say hello” is the specific request, question, or command mapped to a particular intent for the service. In this context, an intent represents a high-level action that fulfills a user’s spoken request. Intents can optionally have arguments called slots that collect additional information needed to fulfill the user’s request. Intents are specific to Alexa and do not share the same structure as Android intents. Defining the phrases users speak to make requests and the corresponding intents mapped to those phrases is part of defining the voice interface for an Alexa skill. For details, see Defining the Voice Interface. The service that implements the particular skill constructs an appropriate response to the intent and sends it back. This reply can include both text that Alexa converts to speech and information to display in a graphical card in the Amazon Echo App, which is available for Fire OS, Android, iOS, and through web browsers. Alexa converts the provided text to speech and reads it back to the user. If you include information for a card, Alexa also sends the card to the user’s Echo App. How do I create an Alexa Skill? An account on the developer portal. 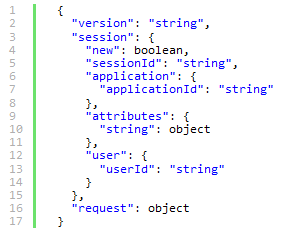 You use the developer portal to create a configuration for the new ability that includes the information the Alexa service needs to route requests to your service. The ability to develop and deploy a cloud-based service to an Internet-accessible endpoint. The service processes user intents and returns replies to the user. For details, see Deciding How to Host Your Cloud-based Service. A development environment appropriate for the language you plan to use. You can author a Lambda function in Node.js or Java. You can author a web service in any language appropriate for web services. Route requests to the web service or AWS Lambda function that implements the skill. AWS Lambda is a service offering by Amazon Web Services. Display information about the new capability in the Amazon Echo App. Note - You must register a skill before you can test it with an Echo device. Customers will never interact with your Cloud-based service directly, instead all of their requests will go to the Amazon Alexa Service which in turn will create http post requests your service handles using a predefined contract you have set up. • Each intent consists of two fields. The intent field gives the name of the intent. The slots field lists the slots associated with that intent. • Slots can also include types such as LITERAL, NUMBER, DATE, etc. The mappings between the intents you define and the spoken utterances that invoke those intents are provided in a tab-separated text document of sample utterances. • Each possible phrase is assigned to one of the defined intents. The Alexa Service will use these configurations to know how to call your cloud-based service endpoint and to understand how your customer will be talking to an Alexa-enabled device like Echo. Note – The more sample utterances you include the better Alexa will be able to understand your customers. Make sure you include as many utterances as you can with different samples of data. *Note – AWS Lambda now includes a code template that will automatically handle all of these requests for you and does not require the creation of an SSL certificate. For more information on creating an Alexa AWS Lambda compute function click here. The Java Web Based Service example provides a Hello World example. The Node JS Lambda samples provide an array of scenarios including database access and storing session attributes. Here is a complete list of the samples available to download. When a user asks Alexa to perform an action that is mapped to a particular skill, this opens a new session. All requests from this user are directed to your service until the session closes. Each request sent to your service includes a flag you can use to determine whether a session is new or existing, and you can use session attributes to save data with your response during the session. These samples illustrate managing this session. A service can manage a conversation with different stages in which you keep track of the stage the user is in. Getting information from various web sites such as Wikipedia and formatting it a voice-friendly way is a useful capability for Alexa, as illustrated with History Buff. The new ability you add to Alexa may need to persist data between sessions so that users can resume where they left off later. Score Keeper illustrates reading and writing to a database using AWS DynamoDB, which is very easy to access from a Lambda function. If your service returns a large list of data, reading all that back to the user may not be very user friendly. When writing for the ear (not the eye), it is better to give users smaller chunks of information and let them control how much data they want. You can do this by implementing pagination – read back X items in a list, keep track of where you are in the list, and prompt the user if they want more. The NUMBER slot type converts numeric words into digits that you can then manipulate as numbers. The DATE slot type converts phrases representing absolute and relative dates into date formats. 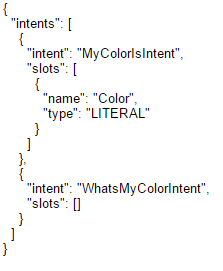 The LITERAL slot type passes the slot data to the intent with no conversion. These slots are useful for some free-form data, but work best with short phrases, such as names. You do not need to administer or manage any of the compute resources for your app. You do not need an SSL certificate. You do not need to verify that requests are coming from the Amazon Alexa service yourself. Access to execute your function is controlled by permissions within AWS instead. You can download the AWS Lambda Node JS samples here and the Java AWS Beanstalk samples here. With the launch of the Alexa Skills Kit (ASK) you have a unique opportunity to create new Alexa skills that customers can teach their Alexa-enabled devices, like the Amazon Echo. By submitting your Alexa skill today you will be ready when we launch the first new capabilities built using ASK later this year. We can’t wait to see what you create! 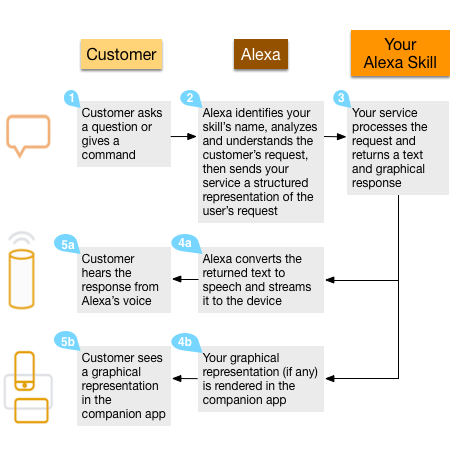 The Alexa Skills Kit (ASK) is a collection of self-service APIs and tools that make it fast and easy for you to create new voice-driven capabilities for Alexa. Alexa is the cloud-based voice service that powers Amazon Echo, a new category of device designed around your voice. With a few lines of code, you can easily integrate existing web services with Alexa or, in just a few hours, you can build entirely new experiences designed around voice. No experience with speech recognition or natural language understanding is required—Amazon does all the work to hear, understand, and process the customer’s spoken request so you don’t have to. This free 38 minute video will introduce you to the capabilities of the Alexa Skills Kit (ASK) using an Amazon Echo device and walk through building your own Skills for Alexa. AWS Lambda will be used as an example hosted cloud service and can be followed along using the AWS free tier at no cost to you. After watching the video you will have an understanding of the Alexa Skills Kit and be able to publish an Alexa Skill that can be enabled on an Amazon Echo device. With the launch of the Alexa Skills Kit you have a unique opportunity to create new Alexa skills customers can teach their Alexa enabled devices, like the Amazon Echo. By submitting your Alexa skill today you will be ready when we launch the first new capabilities built using ASK later this year. We can’t wait to see what you create! This was a great week for Amazon announcements benefiting developers. Our really big news, the public release of the Alexa Skills Kit (ASK), was reported by VentureBeat, TechCrunch, Gizmodo, and many others. ProgrammableWeb covered the launch of the Fire OS 5 developer preview, which provides early access to new OS features and updates. In other news, TechNewsWorld contemplated streaming games, Amazon, and nothing less than the future of electronic entertainment while PocketGamer.biz shared our summer plans for the beach. Our $50 app promotion, which ends July 1, also generated a lot of buzz (see PCWorld, AndroidPolice, AndroidAuthority, for example). DroidGamers reported on an update to Kingdom Rush Origins, and AndroidHeadlines featured Amazon’s Cloud Drive app as one of the top new Android apps of the week.